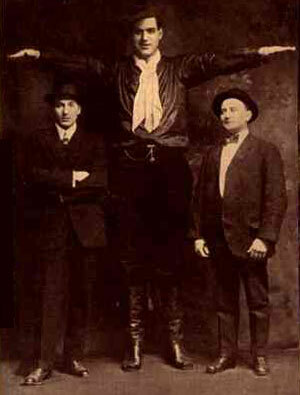 Within recent times a giant of unusual size was to be seen in London in the person of Jim Tarver, who was said to measure 8 feet 4 inches in height. According to his own account he was born on a ranch in Texas, his parents being of ordinary stature, and he did not reach his great height until he was twenty-eight years of age. He is said to be a man of mild and friendly disposition, who shuns publicity and whose great desire is to be back again on the farm.- C.J.S. Thompson, "The Mystery and Lore of Monsters". 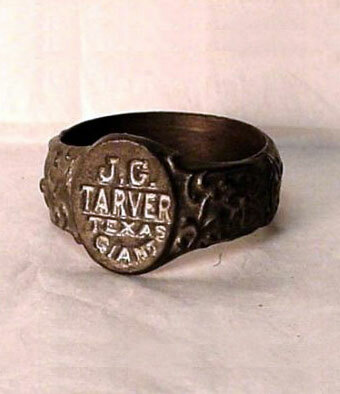 James Grover Tarver was born in 1885 in Franklin, Texas and became known as The Texas Giant, Texas Jim or What-A-Man-Tarver. He travelled with various circuses for 26 years and spent his time off on his Arkansas farm. Plagued by diabetes, he died on his beloved farm in 1958 at age 72. This photo shows Tarver at age 24 and weighing 325 pounds in Dallas, Texas.